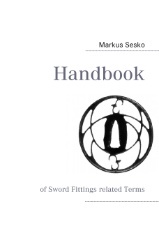 This work focuses on the explanation and the origins of the most common terms in the field of tsuba, kodôgu, and tôsôgu. Terms from all areas are explained in detail, like zôgan (inlay), hori (carvings), iroe (colouring), sukashi (openings), dôgu (tools), jigane (raw materials), jimen (surface and surface finish), etc. Most of the explanations are supported by illustrations.